SUMMARY: We use the magic of radio to fly around to garden roof tops in Brooklyn USA, a permaculture fruit farm in Quebec, and small acres restored in Nottingham UK. Buckle up. On the rooftops of Brooklyn New York, the Brooklyn Grange raises local food and hopes in America’s largest city. Anastasia Cole Plakias is the Vice President and a Founding Partner of Brooklyn Grange Rooftop Farm. 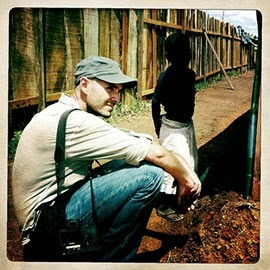 Olivier Asselin is a film-maker and free-lance photographer, recently back from years in Africa. Now in the Canadian province of Quebec, he set out to make a film about permaculture. That sounds simple enough, but along the way, Olivier discovered it’s a big task with many fertile directions. Courtesy of film-maker Olivier Asselin we’ll hear the audio from his first short film on the permaculture orchard founded by Stefan Sobkowiak in southern Quebec, Canada. It’s turned the whole idea of monoculture orchards on into a natural fountain of many fruits. In the UK, Rob Carlyle built a low-energy house. With partner Jill, they are refashioning an overgrown woodland into gardens suitable not just for humans, but for all the creatures. His blog at sustainablegarden.blogspot was named one of the ten best garden blogs by Ecologist magazine. Radio Ecoshock investigates. As global oil becomes more expensive, and then runs out, major urban centers need to figure out their local food supplies. We find a solution in Brooklyn, New York. Anastasia Cole Plakias is the Vice President and a Founding Partner of Brooklyn Grange Rooftop Farm. I expected to find container gardening on these roofs, but a video on your web site seems to show a virtual dirt field right on top of one building. One of my first questions: What are the advantages of avoiding container gardens? The buildings used by the Brooklyn Grange are old cement monsters with plenty of capability to hold the load. Of course they got that checked out by engineers first. Anastasia tells me containers actually waste space that could be planted, plus there is the weight of the containers themselves. As you can see in this picture, they just planted everything between the parapets. One rooftop is about an acre, the second an acre and a half. The group gets at least 50,000 pounds of produce out of that. Their growing season in Brookly was longer, with some greens and root crops coming out of the farm as late as November. This may be partly due to the urban heat island effect: New York City throws off a lot of heat. This year may be different, as the very cold winter turned into a later and colder spring. Everything grown is organic. These farms not only feed customers in Farmers’ Markets and restaurants, but also the families of the farm crew. They don’t want pesticides in their own food, and don’t want to add more to NYC. Speaking of that, the bees in their sub-project, the Brooklyn Grange Bees Apiary, do better than some in the country. This may be due to fewer agrichemicals and pesticides in the city! They do lose bees over each winter, but then overcome that and gain bees during each summer season. Anastasia tells us the NYC spring honey is excellent, with almost a menthol taste coming from the flowers of the city’s many Linden trees. People may wonder if the honey contains pollution from the city. I can tell you my friend at the University of Exeter, Toxicologist Paul Johnston, tested honey from hives on a rooftop in down-town London. He found the honey was completely free of harmful chemicals. The bees purify their honey, no matter what the pollution. Isn’t that amazing? The Grange helps organize the annual New York City Honey Festival every year. The next one is September 7th, 2014. Also: the air is far less polluted up on the rooftops, than it is down in the street. Our guest has here own radio show on the internet Heritage Radio Network. It’s called “Anastasia’s Fridge“. One point of this interview is that while cities will never feed themselves, they could go a long way toward providing fresh, natural produce in season. The Brooklyn Grange folks train others to make rooftop gardens, including some restaurants who now grow their own greens and herbs. In the interview we also talk about educating inner city kids about the benefits of compost and bugs, plus the effort to get more nutitious fresh food to the “food deserts” which previously only had convenience stores full of junk food. There are so many angles to this story, so many positive solutions from the city Grange idea. Check out the Brooklyn Grange here on the Net, and on Facebook or Twitter. Download or listen to this 21 minute interview with Anastasia Cole Plakias in CD Quality or Lo-Fi. We’re up against a challenge greater than any in history. What is possible? Maybe we should check that out at possible.org. Our guest is Olivier Asselin. He is a film-maker and free lance photographer, recently back from years in Africa. Now in the Canadian province of Quebec, he set out to make a film about permaculture. That sounds simple enough, but along the way, Olivier discovered it’s a big task with many fertile directions. In fact, Olivier found so many stories in permaculture, after his successful Kickstarter campaign, he’s releasing a series of shorter videos free on his web site. As some inspriation, Olivier also mentions Paul Wheaton and permies.com who helped promote the Kickstarter campaign. Courtesy of film-maker Olivier Asselin we hear the audio from his first short film on the permaculture orchard founded by Stefan Sobkowiak in southern Quebec, Canada. You can watch that 9 minute video on You tube here. It gave me ideas of things I’d like to try, if we get land enough some day. Listen to/download this 20 minute piece with Olivier and Stefan’s film clip in CD Quality or Lo-Fi. In our continuing journey to discover balanced lives, we travel to the hill country of Nottingham, inland in north England. Our guest is Rob Carlyle. With his partner Jill, Rob has built a low-energy house. They are refashioning an overgrown woodland into gardens suitable not just for humans, but for all the creatures. His blog at sustainablegarden.blogspot was named one of the ten best garden blogs by Ecologist magazine. In restoring his land, Rob used the lasagne method. You layer compost, ferilizer and cardboard until the unwanted species disappear, and you can plant something better. Read about lasagne gardening here in the Mother Earth News, or try this video on You tube. Most of my shows warn we are more or less going to hell in a handbasket, as we wreck the atmosphere, land, and sea. Rob describes the personal feeling of salvation of leading a more honest, balanced life. It may not save the world (right away) but it may save you. That’s our tour of growing solutions this week on Radio Ecoshock. You can suggest guests any time, using the contact form on the show web site at ecoshock.org – or email me. The address is radio //at// ecoshock.org. Let’s do it. Let’s make a permanent culture to replace the tottering throw-away world we have now. Don’t forget to visit our new Radio Ecoshock page on SoundCloud, where you can listen or download right now. We’re wrapping up the April fund-raising drive. That’s where I try to raise enough money to pay the bills right through the summer months. I hate asking, but it costs money to make all our past and present programs available as free mp3 downloads. That’s so important to get the word out on these under-reported issues. Literally thousands, sometimes tens of thousands, of Radio Ecoshock shows are downloaded every month of the year, by people all around the world. That takes bandwidth. I also have equipment to replace, and general costs like long-distance telephone calls all over the world, studio rent, and all that. There are two ways you can help this program continue. The very best is to take on a sustaining membership, which is ten dollars a month. That lets me budget. It gives me some security even during lean months. You can do it by clicking on the membership button at the “about” page at ecoshock.org. If you prefer, a one-time donation of any amount is also very welcome. You can do that from the web site or from the show blog at ecoshock.info. I may not have time to thank each of you individually, but I want you to know it gives me heart and determination when listeners are willing to help, even in tight times. In fact, to any of you that I missed, don’t think I ignore your donations. I appreciate all of you so much. Even if you are not in a position to help financially, it means a great deal that you are willing to donate your valuable time to listen to the program each week, and get informed on the truly important issues of our day. 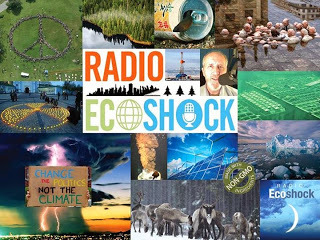 You can still help by Tweeting, Facebooking, and otherwise passing on news about Radio Ecoshock, and links to the show, so others can listen. Like this cool photo montage and promo for the program created by my Facebook friend Michael MadLove. What a great tool to pass around! Feel free to make a CD, or a bunch of CD’s of this program, to play at a public or private event, or hand out to those who have ears to hear. We need to build a critical mass, a growing wave of awareness and demand for change, one human at a time. That’s what it’s all about. I've been enjoying your show for a while now, thanks a lot for your hard work. Craig Morris is an American journalist living in Germany who tirelessly writes against the misconceptions and blatant lies repeated over and over in the mainstream anglophone press to malign the German Energy Transition and the nuclear phaseout. Considering how widespread these misconceptions are, even in the environmental community, I think your message could benefit from someone setting the facts straight with inside knowledge. Reporting the facts about and raising awareness of the German Energy transition is his job, but he's so passionate about it that I'm sure he'd jump at the chance of talking to an American/Candian audience directly.